Appearance: White background with violet and golden veins. 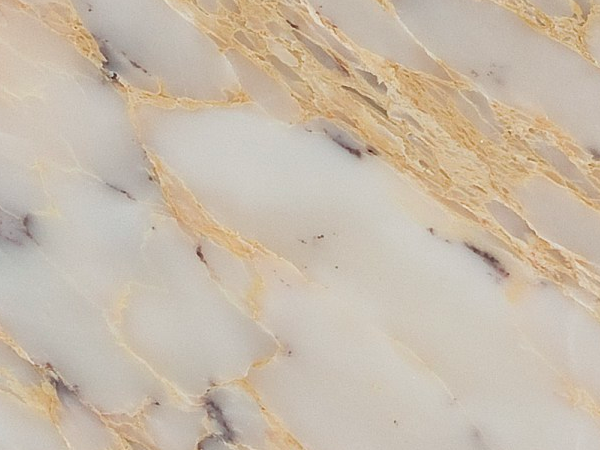 Its striking appearance is ideal for projects with the “wow” factor: its translucence makes it perfect for backlighted feature stonework, whether it is flooring, staircases, wall covering or counter tops. Properties: Petite Fleur is a magnificent and outstanding marble with excellent chemical composition and technical properties. Colour variation and movement occur, even in the same batch, and are part of the charm of this materiel. It is recommended to seal this stone to extend its longevity. Use: Due to its good properties, Petite Fleur is suitable for most indoor applications, such as flooring, wall cladding and bespoke stonework, including staircases, fireplaces, vanity tops and shower trays. Like most marbles, special care is required for kitchen worktops and other surfaces subject to acid liquids (e.g. lemon juice and vinegar), which would take the shine off and cause discolouration. Finally, its translucent effect makes it perfect for backlighted installations. Finishes: Polished and honed. Other bespoke finishes are also available, upon request.